As water is our most precious natural resource in irrigated farming, conservation and quality preservation are two of our primary objectives. 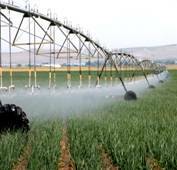 Accordingly, a key component to our irrigation management is the use of low pressure pivot irrigation systems with variable drive pumps, controlled and monitored by radio telemetry. 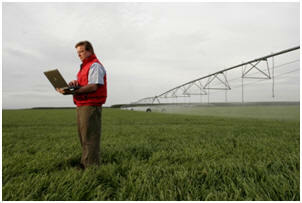 Pivot irrigation systems provide some of the most efficient and cost effective water applications available. They can operate in a wide range of terrain and soil type, offer an almost infinite application quantity, and can be very closely monitored and controlled. When combined with low pressure sprinkler heads and variable drive pumps, they are very energy efficient as well. A typical pivot system or “circle” irrigates 125 acres. A typical sprinkler, like the portables we all use in our garden, are high pressure impact type sprinklers. For many years (and still in use by many other farmers today) overhead impact sprinklers were the preferred application tool on pivots. However, with the development of the low pressure, drop nozzel sprinklers we have been able to use approximately half of the water and energy to grow the same crops. We have also greatly reduced our water runnoff from the field thus reducing soil erosion, have precise control of crop protection and fertility applications, and can manage soil condition on a daily basis. Historically, irrigation systems have been controled by two switches – an on/off at the pivot and an on/off at the pump. The pivot could be sped up or slowed down, with varying degrees of acuracy and you had to be there when it finished so you the system did not overlap/overwater. On a farm with multiple center pivot irrigation systems, monitoring water applications was labor intensive and not a very exact science. In addition, electric pumps had two speeds – full speed or completely off. Thus, if you had a pump that would supply enough water and pressure for four center pivot irrigation systems, but only needed to run two pivots, you had to apply water where it was not needed, thus wasted water and energy. On Hale Farms’ primary irrigated farms, we have installed automated, precision control systsems for each pivot. Pictured at right is a picture of one of our actual control panels. As you can see, there is a wide range of control points, diagnostic equipment, and monitoring items. Here, we can control nearly every aspect of the machine and develop application programs that speed up or slow down the machine as different points in the field (if there is a low spot or variation in soil type) and set them to shut off automatically, when finished or in an emergency. A key component of this type of control is the ability to data log, store, and analyze operating information. Safety and ease of operation is also a significant asset. However, one of, if not the primary beneift of this panel is the ability to remotely control the pivots and pumps through a radio telemetry system. 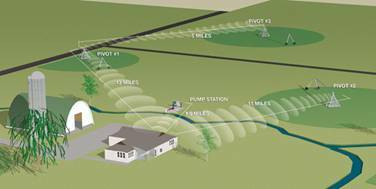 Through the use of a base station computer, FM radios, and our wireless network, we are able to remotely control the entire irrigation system, including pivots and pumps, as diagramed here. Instead of having to drive a vehicle to each center pivot irrigation system to start or stop the system and/or switch irrigation watering from one field to the next field, one person can now control over 100 center pivot irrigation systems and pumps from one office location. The base comptuter allows the operator to view the actual center pivot or pump control panel on the computer screen to control and monitor the machine and/or make program changes. The base computer also allows the computer operator to supply food to the plants (fertilzer) or medicine to the plants (chemicals) by turning on pumps containing these items, which are located at the center pivots irrigation systems. This computer also controls newly installed variable frequency drives for our electric motors that drive the water pumps. The variable frequencey drives give the pump the abilty to run at nearly any capacity between 0 and 100 percent. Thus, allowing us to turn on and use, only the amount of water that is prescribed for that day. We have also installed pressure monitors at key points in our larger systems that are monitored by the telemetry. As the amount of pressure the system operates at is directly proportionate to the power you use, it is very importand to keep the system at the correct pressure – to much water pressure means you waste energy, to little water pressure and the water does not get applied to the crops correctly. 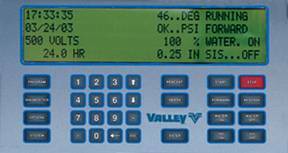 The radio telemtry system takes into account; 1) the number of center pivots irrigation systems turned on, 2) the water pressure points, 3) then a computerized program turns on the correct number of water pumps required, and 4) the computer also sets the speed of the variable frequency drive motors. Thus, allowing Hale Farms to literaly operate the irrigation system at peak efficiency for water and energy conservation.